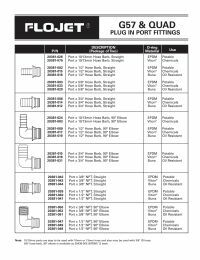 Quad Plug In Port Fittings 20381-008 for pumps with a 3/4" port opening that accepts Quick Disconnect (QD) style O-ringed fittings including Aquajet, Aquatec 550 Series, Jabsco (3XXX0), FloJet (04XXX) and ShurFlo. Typical port openings include a Sliding Clip to secure fittings in port. The quick connect port system makes hose removal very easy and allows fast winterizing and system draining.